The effects of the drought. A month dominated by the continued spell of good weather – which influences everything in the garden. Most significantly is the water supply – keeping the spring source running and ensuring all the water courses in the garden are clear. However there is just not enough volume to keep all topped up as normal – the Temple pond in particular suffers and drains down to a low level (though recuperates whenever there is a little night-time rain); the Lower pond in the Parkland too has dropped and the wooden aqueduct stooped flowing. Nothing more can be done at present but just keep everything ready for whenever and whatever rain comes and sets right the natural spring again. A more serious long term issue is with the water supply to the house and outbuildings – the existing system just does not seem to cope or work adequately well – a new reservoir installed by the spring seems to be the only viable solution as existing pipework and tanks are losing precious water and keep blocking. But of course all this sunshine and warmth has brought a flurry of growth – the Allotment and Kailyard are fully growing, bulked out with fresh green leaves, both decorative and productive. These too need a water supply to keep them going, so it is a constant round of rationing and making sure nothing suffers too badly. Container plants too demand much more attention and irrigation than usual. Some areas of course show the signs of drought more badly than others – the grass bleaches yellowy brown and is patchy – there is little hope of more germination in the worn patches for now. Almost inevitably it is those things that we do not want to grow that seem to be thriving the most – our attempts to curtail willow herb seem to be working for the moment and it is not quite so prolific, and there has been a concerted round of pulling out nettles – particularly along the grass path edges and wherever they are obvious in the garden. There is also an abundance of Galium aparine – or Robin-run-the-hedge – which is easily pulled out but almost instantly seems to regroup and grow again. Ragwort is removed where it looks unseemly. More planting out in the Front garden and Pompeiian garden to supplement and change the existing planting – we will see what works and survives and that can inform forward planning for next year. All of the renovated planting in front of Philomen and Baucis temple looks splendid and is full of colour. The new trees planted out this spring need watering until they get established as they too have been showing the side effects of dried out ground. 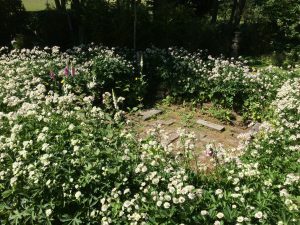 One other dominating problem tackled is the omnipresence of Sweet Cecily – particularly in Julie’s garden and in front of the house – plants have been cut down or pulled out so that it is more in balance and keeping with the surrounding planting and artworks. A round of cleaning the artworks has begun to keep everything looking pristine. Huff Lane is cut back and nettles pulled out to keep it looking clear and tidy again – also a quick round of trimming the box hedging is completed – it seems to be enjoying the conditions and is putting on good new growth. The little wooden humped back bridge on the hillside is repaired and a wasps nest removed from its underside – an unpleasant surprise for some visitors crossing over. Yellow raspberries are in abundance in the wild garden – as other fruits – blackcurrants and redcurrants – change colour and ripen – and it looks like we will have a plenty of brambles this year as they are heavily laden with berries.